You’ve decided to step up your training and buy a punching bag. But how do you decide which product is right for you? What’s the best punching bag brand? How heavy should the bag be? Does the size matter? This article will answer any questions you may have about finding the perfect product. The general rule of thumb is that you should always buy a heavy bag that weighs half your own weight. 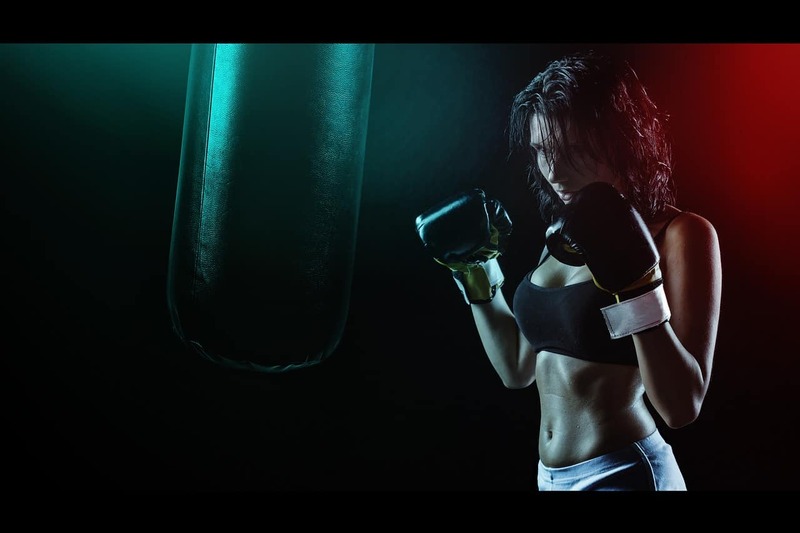 This is usually solid advice, but the ideal weight heavily depends on your martial art and the experience you desire. If you are involved in a sport that involves kicking, like MMA, muay thai, karate or kickboxing, you will need a longer, heavier bag than the standard. Kicks pack more power and will make the bag bounce around more than punches. The striking area also needs to be bigger to accommodate for leg strikes. To find out the ideal size of a heavy bag for you, take a look at our Punching Bag Size Chart & Weight Calculator. There are several different types of filling that heavy bags use. Each type provides a vastly different experience for the user. Harder filling will help you build more punching power, but low-quality filling like sand can cause injury. Sand-filled heavy bags are the cheapest, and usually the worst, as sand makes up a very hard striking surface. Sand also tends to settle in one area more than other types of filling, resulting in “empty” or particularly tough areas which can cause discomfort or even injury when punched. Cloth-filled heavy bags are most common in gyms and homes around the world. They provide a much better striking surface, and typically last longer than sand bags. If you’re looking for a conventional boxing bag, I would advise you to go for one filled with cloth. Water-filled heavy bags have a surface is always even and the water filling never settles. They allow easy transport and cheap shipping, as they can easily be emptied and re-filled and are delivered empty. It’s a love-or-hate type of bag – the surface provides less resistance and generally feels very different to a standard heavy bag. While the filling determines the quality of your workout, the cover material affects the durability of the bag itself. Leather is most durable, and most expensive. This type of material is incredibly resilient to tearing and can last for decades. Vinyl bags are usually cheaper than leather, but are still resistant to abrasion, humidity, and tearing. Vinyl is a great option if you want something durable, but don’t want to bust your wallet on a leather bag. Canvas bags are usually the cheapest, but also the least durable. They’re usually a good option for beginners or fighters that only practice on their heavy bags periodically. There are many different types of punching bags. While their basic purpose is the same, each one offers a different workout and has it’s own benefits. If you think this is the bag for you, make sure to take a look at our 5 best punching bags review before buying one. A large, cylindrical bag, usually suspended by chains or straps. A standard tool for punching practice, it is what most people think of when they say “punching bag”. Considered by many to be an essential piece of boxing gear, it allows the user to improve power, speed, technique and movement when used properly. The standard weight of a hanging heavy bag is 100lbs, although the ideal varies from fighter to fighter. The heavy bag is seen both indoors and outdoors, commonly suspended by straps from a ceiling or a heavy bag stand. A slimmer variant, the banana bag, is most commonly used for muay thai. It’s considerably longer than a typical boxing bag, allowing you to effectively practice kicks, elbow strikes and knee strikes too. A stand up punching bag serves the same purpose as a hanging bag, only it’s mounted on a pedestal rather than hanged from above. While both serve the same purpose, a free standing bag carries the additional benefit of allowing MMA fighters and wrestlers to practice ground and pound techniques. The base of the bag can be filled with sand or water, giving it more weight and stability. The average weight of a free-standing bag is around 270-300lbs once the base filled. Punching dummies like the BOB punching bag fall into the category of free standing heavy bags, the main difference being that they try to simulate a live opponent and provide a realistic way to practice precision and vital area strikes. A freestanding punching bag is also a common piece of home equipment for boxers who are limited on hanging a regular heavy bag. Although we should note that a regular punching bag combined with a punching bag stand is generally a preferred choice for pure boxing. A speed bag is a small, light bag anchored to a platform with a speed bag swivel. Contrary to what the name suggests, it’s purpose isn’t to improve speed – it’s to improve hand-eye coordination, reflexes, and timing. A double-end bag serves the same purpose as a speed bag, but it’s attached to both the ceiling and the floor – causing it to rebound with more unpredictability. Outslayer is one of the best punching bag brands in the world. Their every product comes with a 10 year warranty, the filling and the covering of their bags is extremely resilient, and their products aren’t ridiculously priced either. Best value for your money. Ringside also makes high-quality equipment. Their leather bags are incredibly durable and the soft-fill technology some of their bags use provides a smooth, soft surface that feels great. Century is a great choice when it comes to free-standing heavy bags. They’re one of the biggest standing bag manufacturers in the world. On the other hand, their hanging bags don’t quite compare to the quality of other brands. Title generally makes great boxing equipment, but when buying a punching bag, there are honestly better brands that offer more for the same amount of money. This doesn’t mean that Title is a bad choice – their heavy bags are generally durable and not too expensive. Everlast heavy bags are a gamble. Their low-end, cheap equipment isn’t very durable, and is only suitable for beginners. It only gets good as you go up in the price range, but at that point Outslayer or Ringside offer more bang for your buck.